The Gibraltar Elite Large post-mount mailbox accommodates larger boxes, with room to spare for other parcels and deliveries. A leading choice for home owners, the powder-coated finish helps protect against rust and the galvanized steel construction provides extra strength. 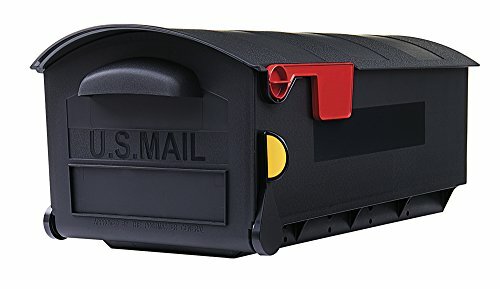 This mailbox also features an adjustable door latch for a tighter grip. The Elite Large measures 10.9" H x 8.7" W x 22.6" D.
The Gibraltar Elite post-mount mailbox is a leading choice for all home owners. It's powder-coated finish will be sure to keep its shine throughout the years. Constructed with tough galvanized steel and big enough to receive small packages, the Elite lives up to its name. Provides ultimate mail security, and keeps you safe from mail identity theft. 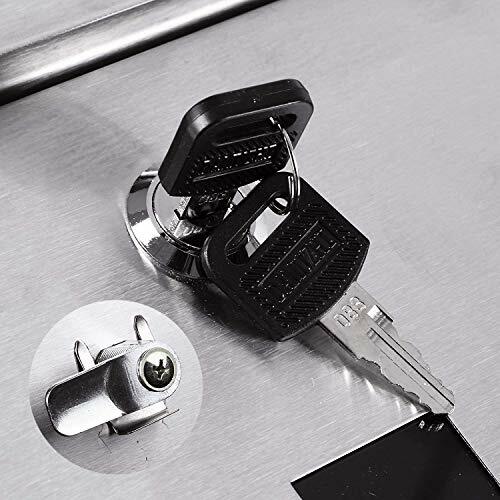 An exclusive patented anti-pry latch locking mechanism prevents leveraged entry. 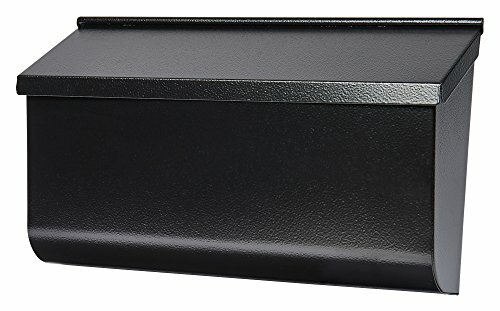 Features 14-gauge to 16-gauge electrogalvanized welded steel, high security lock, 3 keys, and package bin mailer. 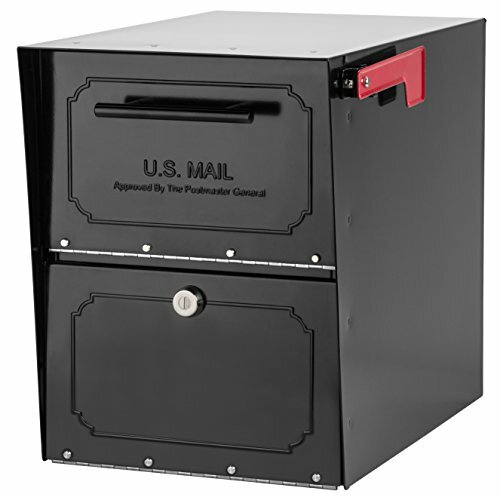 Full service, large capacity curbside locking security mailbox. Locking access door with commercial grade high security wafer lock. U.S. Post Master Approved. Durable powder-coated finish. 1.9" H incoming mail slot accepts a box of checks. Limited lifetime warranty. Dimensions: 21" D x 12" H x 10.6" W. Black. 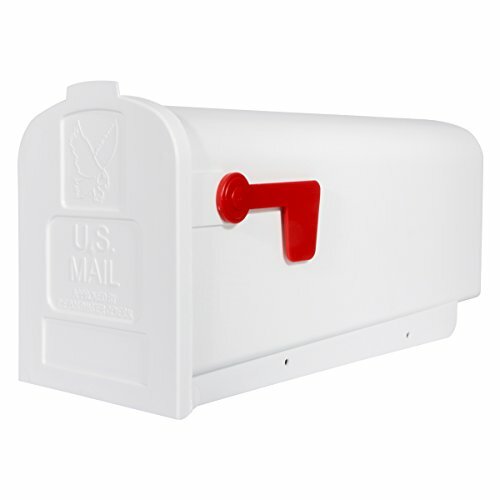 The Gibraltar Patriot post-mount mailbox is constructed from sturdy, rust-proof plastic material. 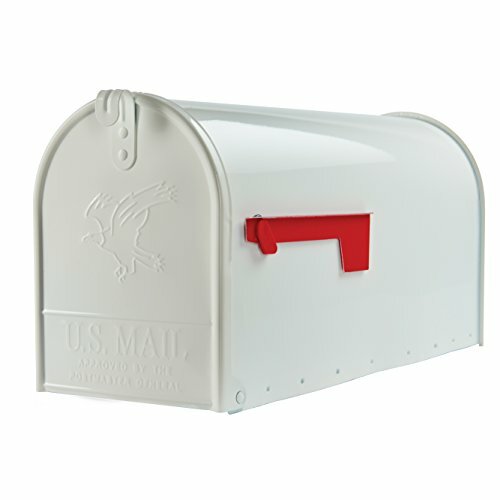 This mailbox is weather and impact resistant for longevity against weather elements and day-to-day use. Its large size can receive multiple deliveries including padded envelopes and small boxes. The Patriot has a fresh look to match any landscape, and includes blank spaces on the door and side to add customized letters or numbers. Includes a standard outgoing mail flag for the Postmaster, and also a received mail indicator flag to alert you that mail has been delivered. Brand: Gibraltar Mailboxes | Manufacturer: Solar Group, Inc. The Gibraltar Elite Large post-mount mailbox, takes the Elite Medium to a new level. The Elite Large can hold larger boxes, while still accommodating for other parcels. A leading choice for home owners, the powder-coated finish will be sure to keep its shine for years to come. Constructed with tough galvanized steel for extra strength. The Gibraltar Whitley mailbox post is wonderfully designed to fit over a 4x4 post for a straightforward installation. 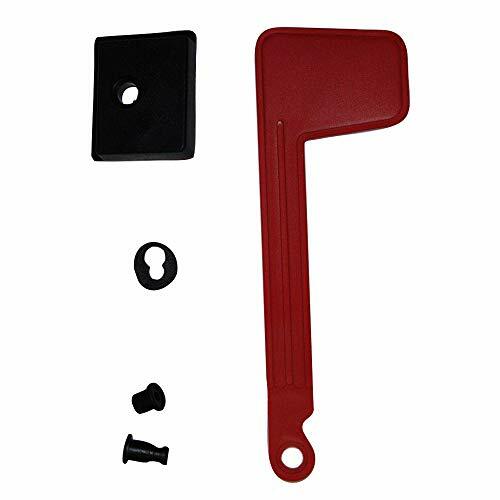 Its tough plastic material will provide strength and protection against outside elements. Proudly made in the USA, mounting hardware is included for your convenience. BoxLock is the only internet-connected lock specifically designed to secure your home deliveries. It s simple to use BoxLock. your delivery driver simply grabs the BoxLock and presses the button on the top to scan the tracking number on your package. 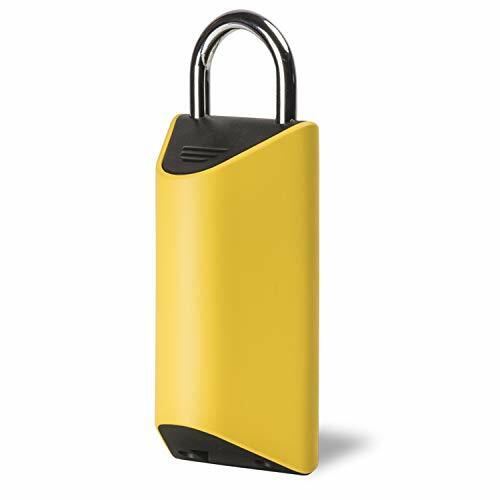 Only packages addressed to you and that are actually out for delivery that day will unlock this smart padlock. The driver opens the bin, places your package safely inside, closes the bin and locks the lock. Each time a package is scanned your BoxLock connects to your Wi-Fi to confirm whether or not it should open. Using the mobile application on Android or iOS, BoxLock users can open the lock or share access by texting or e-mailing barcodes to friends and family for one-time use, multiple users or specific dates. Using BoxLock's Effortless Tracking feature, Box Lock automatically collects tracking numbers from USPS, UPS, FedEx and for any packages being delivered to a household. This latest version of BoxLock incorporates security enhancements, improved battery life and additional features to make it easier for drivers. 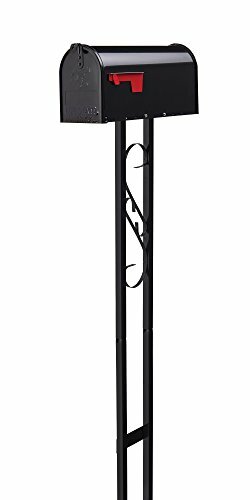 Includes decorative post and mailbox support arm - Note: 4x4 wood post, mailbox, and mailbox mounting hardware NOT included. 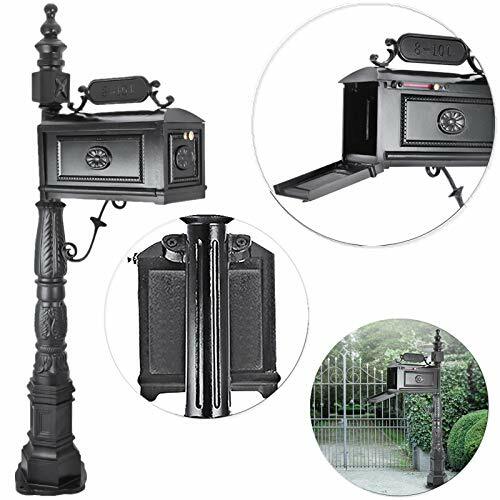 The Gibraltar Decorative Scroll all-in-one mailbox combo is an optimal choice for replacing your mailbox and post simultaneously. This combo includes one of Gibraltar's best selling medium capacity mailboxes, a mounting bracket and decorative post. It's everything you need all in one convenient package. 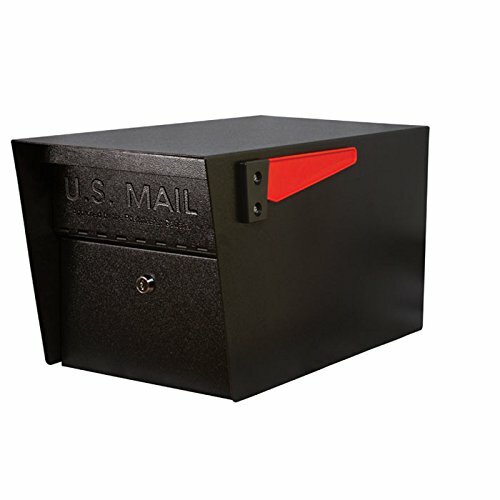 The mailbox and post combo are all painted in a black powder-coated finish to prevent from rusting and discoloration from other elements. It is constructed from galvanized steel to provide strength, and the decorative scrolls featured on the post are an eye-pleasing, delicate addition to your landscape. 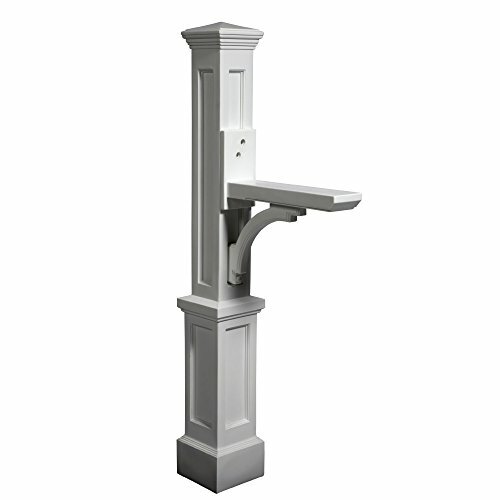 The Gibraltar Parsons post-mount mailbox is a great choice for any home landscape. The polypropylene material is guaranteed to never rust and the ultra-violet inhibitor increases it's resistance from potential sun damage. The Parsons also comes fully assembled for quick installation. These solar mason jar lids with fairy lights are very decorative, you can just put them in flat place to add the atmosphere of festivals, ceremonies, weddings and so on. They has upgraded design so they are waterproof enough to put them in outdoor, balcony, pond, benches... It is an excellent decorative gadget. Each lid includes an AAA 600mA 1.2V rechargeable battery, collect and storage solar energy by the solar panel(2V, 70mA) under the sun. Charge 5-8h by sunlight will light up 6-8h. Specification: Color: White Solar panel: 2V 70mA solar panel Battery: AAA, 600mA, 1.2V String length: 97 cm appr. Lights amount: 10 micro LEDs Spacing: 10 cm appr. between two LEDs Lid diameter: 7 cm Lid height: 1.5 cm Insert diameter: 5.5 cm Package includes: 6 x Mason Jar Solar Lights Lids Without Mason Jar and Handle User Manual: 1.Turn over the lid and find the on/off switch, turn it to on. Remove the protection film from solar panel. Screw onto the mason jar, put it in sunny place. 2. If you open the ON switch, Then the lid lights will automatically on/off by light sensor(already built-in), it will bright at night or in dark environment; and vice versa. (Put them under the direct sunlight is better 'cause it's mainly solar powered.) Warm Prompt: 1.Due to the difference between monitors, the picture may not reflect the actual color of the item. 2.If you receive the lid lights and find it is not bright, please put the lids under the sun for charging at first. Please ensure turning on the switch behind EACH lid before charging by solar. 3.If there is long time without solar charging, it can also working by internal AAA rechargeable battery only. 4.If you meet any other problems pls don't hesitate to ask for our service. Any comments from you is vital to us. Solar Powered: This mason jar lid lights lighting by solar energy or an rechargeable battery, needless to use external wires, save energy and super environment protection. Good quality and efficient solar panel ensures the solar energy be stored, it absorbs sunlight during the day, and releases it into electric energy at night to glow the lid lights. Also a mason jar lids with battery operated, so don't worry the cloudy weather problem. Starry Fairy Lights: 3 color types for choosing. The LED string light beads are high quality, bright strong. These firefly fairy mason jars solar lanterns are perfect as indoor and outdoor craft decoration. Especially nice for weddings, parties, birthdays, festivals, anniversaries, Christmas, holidays ornaments. Only place them in garden, pathways, or put them in house, shelves, porch, also an ideal decoration. Cool and patio lights string led decor lights for room, too. 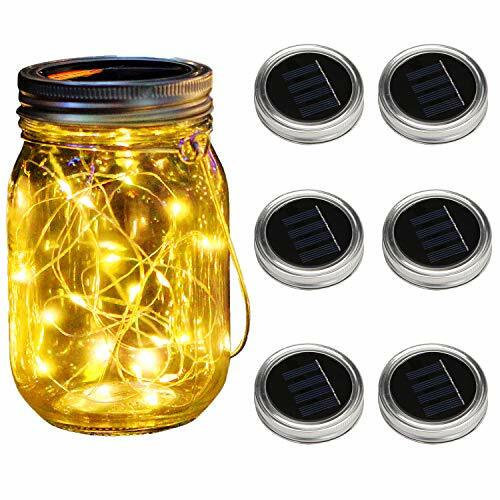 Innovation Design: For giving you multiple choices, we sold 6 pack mason jar lights 10 led solar fancy jar lids string lights without handles. In case you already have or don't need them. Brilliant lights for no light. Lovely and beautiful light jar, with ON/OFF switch on lid case, never need to use power outlet. Creative and portable design. Solar mason jar lights outdoor and waterproof mini fairy lights. Long Life Used: Waterproof design, so they are safe and not easily broken in rainy days outdoors. Super easy to operate, you just switch it on, twist it on a mason jar, and put it in a sunny place, then it will automatically light and extinguished. So long as the sun exist, so long the mason jar lights is use. Very match wedding or festivals, never out of fashion. Make your house, garden more charming. Warranty: We happy that you shopping with us, and we take you as our precious guest and value your customer experience. If you meet any problems, please don't hesitate to contact us. Before or after you placing the order, we always at your service. 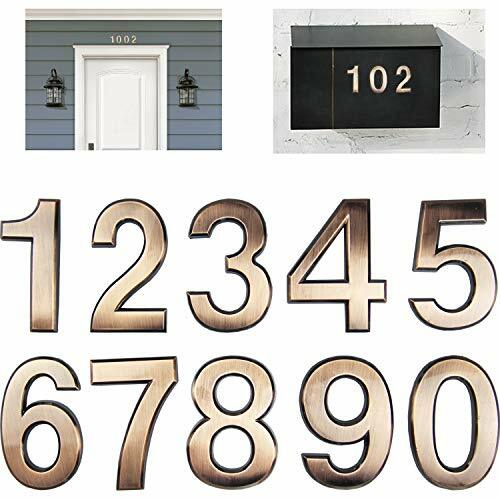 Brand New Shiny Silver or Shiny Bronze durable and waterproof House Numbers. Self-adhesive with strong and durable glue strip, convenient to install. New modern 3D design, easy to read and recognize. Chrome plated surface, super durable and can remain colorfast under bad weather condition. Can be used as house, hotel number plate, door number, mailboxes number or as numeric digit for other buildings. Easy installation: Self sticker with strong and durable glue strip, no need to drill holes. 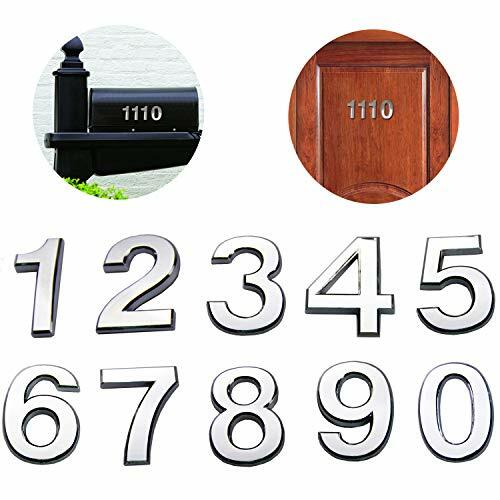 The 10 pack house number including each of 0,1,2,3,4,5,6,7,8,9.In addition, we provide more optional individual number from our store if you need. Multi Color optional: Shiny Silver and Bronze are available. Note This accessories do not suitable for other mailbox and the mailbox come with this accessories.Please do not buy separately. [PARAMETER INTRODUCTION] ~The Whole Mailbox Size: 64 inch x 10.5 inch ; The Postbox Size: 18 inch x 8.5 inch ; The aluminum mailbox includes post, bracket that holds the mailbox, decorative post cap and mounting screws. [EXCELLENT MATERIAL] ~The cast aluminum mailbox is made of stainless steel hardware, which is sturdy and durable, not easy to rust and has a long service life. [SUPERIOR CRAFT] ~The barcelona mailbox post is designed with a classic all-metal rust-free structure, and the surface coating is electrostatic powder coated, which makes the surface of the mailbox have long-lasting properties, including abrasion resistance and corrosion resistance. 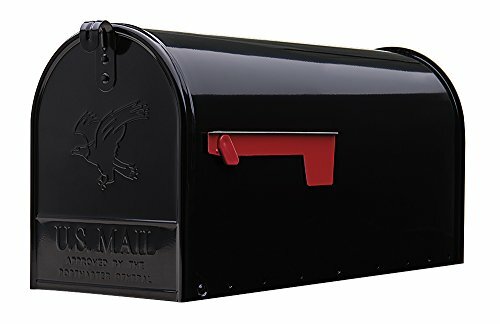 [UNIQUE DESIGN] ~Beautifully compatible with any d cor, decorative mailbox will grace your home for generations to come, classic design that brings compliments from your neighbors. 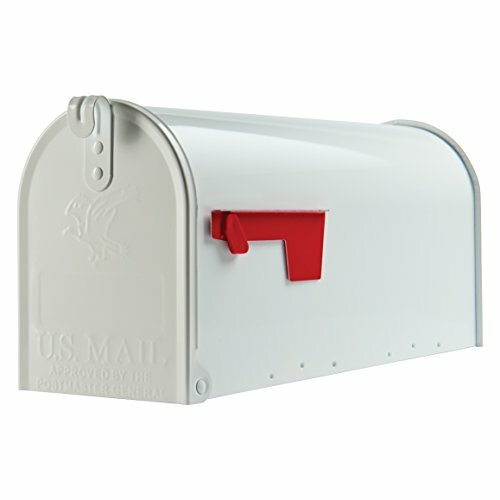 [VERSATILE USE] ~The original exclusive box of mailbox is very easy to install with rust-proof and cast aluminum construction, mailbox is large enough to place daily correspondence and magazines.